I sit down in my favorite comfy chair, get cozy with a warm blanket and a hot cup of tea and open up my beautiful new cookbook from Leah Schapira. No really! I actually did that, with a pile of post-it notes at my side to mark what I knew would be my favorite new recipes. 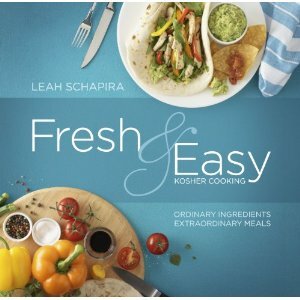 Fresh & Easy Kosher Cooking is Leah’s first cookbook and I am so impressed by her unmistakable passion for food, cooking and sharing her accessible and sophisticated recipes with the world. I start turning the pages of the book and quickly realize that not only are the recipes fresh and simple, but the layout is just as uncomplicated. Almost every recipe has a clear and beautiful picture to go along with it and there are tons of notes and food pairing suggestions to help you make the best meal possible. The recipes truly are ‘Fresh & Easy’ and the pages of my new extraordinary cookbook are now covered in post-its! With over 170 simple and creative recipes filling the pages of Fresh & Easy , I wanted to share my top 10 favorites with you (I was going to do top 5 but I couldn’t decide). It was really tough to chose since they all look incredibly tasty but I think I did it! I included page numbers in case you already have the cookbook and want to open right to these recipes. Sriracha is my favorite hot sauce and it will be yours too after you try this dish: Sriracha Thai Noodles, Parve, page 119, 10 ingredients. I LOVE anything with leeks: Leek & Cheese Crepes, Dairy, page 132, 11 ingredients. A simple ethnic dish that looks absolutely delicious: Creamy Thai Chicken Thighs, Meat, page 180, 8 ingredients. I’ve already had the chance to try out a few of the Fresh & Easy recipes in my own test kitchen and I wanted to give you a taste (pun intended) of the mouthwatering simplicity of Leah Schapira’s recipes. This is a gourmet dish that takes a minute to assemble. 2. Layer half the onion slices in a 9×13-inch pan. Sprinkle with 2 Tablespoons onion soup mix and dot with 2 Tablespoons apricot jam. 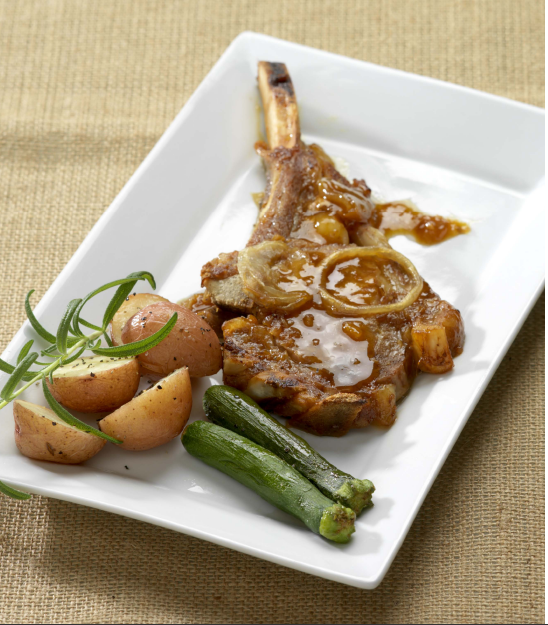 Place lamb or veal chops on top. Dot with remaining apricot jam, sprinkle with onion soup mix, and top with remaining onions. 3. Cover pan very tightly with foil. Bake for 1 1/2 hours. Uncover and bake for an additional 1/2 hour. That’s it! Can you believe how simple this recipe is?!? And to top it all off, the results are absolutely divine. Leah suggests eating this dish with honey-mustard couscous (page 112) and caramelized shallots (page 88). 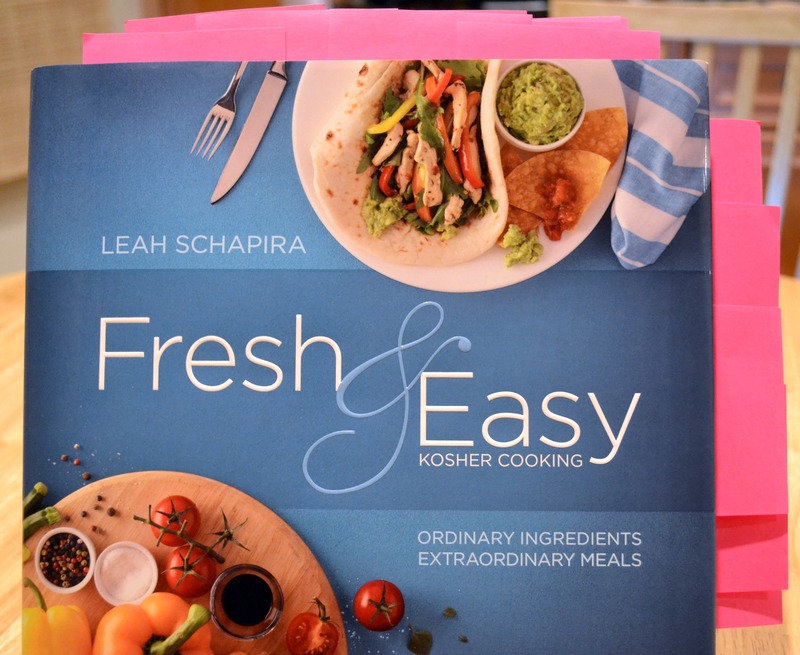 You can buy your copy of Fresh & Easy Kosher Cooking by Leah Schapira right HERE ! To win a free copy of the cookbook, all you have to do is leave a comment on cookkosher.com with your favorite food. It’s that easy! Don’t forget to check out Leah Schapira’s online recipe exchange and culinary website, Cook Kosher, to become part of a community of foodies and home cooks just like you! Great post! I REALLY wishi could cook!